Home > Global News > Africa > Commissions of Inquiry or Omission? Amongst its many other attributes, South Africa could arguably be called the commission capital of the world. While there is no official list of how many commissions of inquiry there have been in the 20 years since 1994, suffice to say that the numbers are impressive. In the last 14 years alone there have been no less than 10 national-level, high profile commissions of inquiry – five of which have yet to run their course – accompanied by scores of others emanating from the executives and departments at national, provincial and municipal levels. What is a great deal more in doubt though is whether all these commissions have achieved anything other than to soak up large amounts of public monies, to control and manipulate public opinion and attention, to avoid political accountability and individual responsibility, to cover-up criminal behaviour, and generally act as vehicles for doing little to nothing? Let’s start with the legal framework. The Constitution gives both the President and provincial premiers the authority to appoint commissions of inquiry. Through delegation of such executive authority there can also be ministerial commissions and a host of others all the way down to the local/municipal level. Ironically though, the enabling legislation remains a hangover from the past; the Commissions Act of 1947. Crucially, the Act states that commissions have to report their findings to the President before they are made public (if ever) and can only make recommendations to government (read: the President and executive branch). In other words, there is no explicit legal obligation for commission reports to be made fully available to the public or for the government to act directly on whatever ‘recommendations’ and findings are contained in the reports. In practice, the resultant script of successive commissions has been all too predictable. Take the Khampepe Commission into the 2002 Zimbabwean elections. Not only did Mbeki and his two presidential successors wage a decade-long legal battle to prevent its release, time and again they brazenly misrepresented the actual findings of the report (which were finally released in 2014 by order of the Constitutional Court). Needless to say, the obfuscation, un-truths and drawn-out Machiavellian manipulation represent not simply a betrayal of the Zimbabwean people but of all South Africa’s constitutional and human rights values which each successive President and government are sworn to uphold. Other Commissions set up by Mbeki followed similar paths. The 2004 Hefer Commission – set up to investigate allegations of spying against the then head of the National Director of Public Prosecutions – turned out to be little more than a cynical exercise in personal retribution and the silencing of troublesome political opponents. More or less the same route was followed with the Khampepe Commission of Inquiry into the affairs of the Directorate of Special Operations (Scorpions) in 2006. The selective release of its findings (over two years) not only served particular intra-ANC factional battles leading up to and after Polokwane, but ensured that a “victorious” President Zuma and his executive could “manage” the preferred outcome; the disbandment of the Scorpions and by consequence, the “disappearance” of a host of possible criminal charges against the President and senior ANC/government officials. to strengthen mechanisms of control … in order to ensure full compliance and alignment with the Constitution, constitutional principles and the rule of law, and particularly to minimise the potential for illegal conduct and abuse of power. However, just at the point when the report was scheduled to be processed by the Cabinet and then tabled in Parliament, ANC factional politics took centre stage, post-Polokwane. The triumphant Zuma faction quickly classified the report and safely (or so it thought) tucked it away in the burgeoning secrecy closet. It then proceeded to introduce, and in July 2013, successfully pass a new piece of legislation in Parliament to reorganise the civilian intelligence services (the General Intelligence Laws Amendment Bill), without Parliament having any access to the Matthews Commission report. Once the report was leaked (it remains officially classified), the reasons for its omission became clear. Its main findings confirmed that South Africa’s intelligence services had become hopelessly politicised, “drawn into the realm of party politics” and thus engaged in “unlawful and unconstitutional” monitoring and investigation of “legal political activity” which “undermined political rights that are entrenched in the Constitution.” It further found that accountability to the public was weak, a “consequence of excessive secrecy”, and that the mandate of the intelligence services was far too broad such that the services had come to see themselves as the main watchdog of society, almost separate and above the constitutional and democratic order. The report made a number of important recommendations. All of this was, and continues to be, ignored with impunity. When it comes to ongoing Commissions, many of which have been plodding on for several years and in the process racking up a price tag of close to R300 million in public monies, the Seriti (arms deal) Commission has taken the “art” of omission to new levels. Arms companies have not been called to testify and few of the implicated individuals have either. Rather, whistleblowers and journalists have been “put on trial” and every trick in the book used to ensure that mountains of crucial evidence are not made available. It is, and can only end up being, a complete whitewash, especially given that one of the respondents in the Inquiry is none other than the very person to whom the report will be handed, President Zuma. And finally there is arguably the most important Commission of the post-1994 era, the Farlam (Marikana) Commission of Inquiry into the 2012 massacre of striking miners. 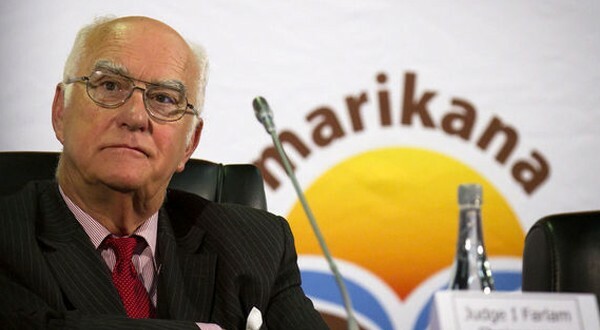 From the beginning and throughout its tenure, the Commission was mired in controversy over its dominant targeting of the miners themselves, a subsequent directive from the President preventing the direct questioning of any government department or agency and the abject failure to fully and critically interrogate the specific role of the employer (Lonmin). Lasting for over two years, the Commission only recently handed its report to President Zuma. Will the report be yet another whitewash? Will the President and his executive once again follow the familiar pattern of refusing to release another commission’s report and selectively spin its findings over time for their own personal and political purposes? Will the Farlam Commission, like most all of its predecessors, be remembered as an expensive and largely cynical exercise in burying the truth and protecting the powerful? Commissions of Inquiry have traditionally become places to park a hot potato until it gets cold. The question for all us ordinary folk is whether or not we will keep the potato hot? Dr Dale T McKinley is an independent writer, researcher and lecturer as well as political activist. Originally from Zimbabwe, Dale has lived and worked in Johannesburg since 1990. He ran/managed a socialist bookshop from 1991 to 1994 and was a full time activist/educationist with the South African Communist Party from 1995 until 2000 (before being expelled for trying to be a communist.) Dale was a co-founder and executive member of the Anti-Privatisation Forum and remains active in social movement/community struggles. He holds a PhD in political economy/African studies. Dale occasionally lectures at university level, gives regular talks to a wide variety of organisations and has produced numerous research reports and analyses for a range of NGOs, academic institutes and other civil society organisations. He is the author three books and has written extensively on South African and international political economy, socio-economic rights/struggles and liberation movement and community politics. Next: Labour Rights and Karoo Farmworkers: Can Power Relations Be Challenged?